The 2019 Mazda CX-5 is a compact crossover SUV. This crossover is a four-door vehicle with a rear hatch for the cargo area. The vehicle seats five passengers and offers plenty of storage space. The Mazda CX-5 features AWD and one of the best fuel-economy ratings in its class. It offers a comfortable interior and excellent ride quality. Mazda has done a great job of turning a utility and family-oriented vehicle into something that's genuinely fun to drive. The new 2019 Mazda CX-5 features some exciting changes and upgrades. The biggest new addition is the optional 2.5-liter, turbocharged engine. This year's model now has the potential for more power than ever before. They've added a couple of new, luxurious trim levels too. These are being branded as the Grand Touring Reserve and the Signature model. Apple CarPlay and Android Auto will now be standard for the Touring model and all higher trim levels. Steering, response and stability all have been improved for the 2019 model. This is largely thanks to Mazda's G-Vectoring Control system. Some of the other notable new features include ventilation for the front seats and a parking-assist camera. The 2019 Mazda CX-5 really ups its game from last year when it comes to engine performance. The new turbocharged engine is the star of the show here. The full name for this power plant is SKYACTIV 2.5-liter, Dynamic Pressure Turbo DOHC 16-valve 4-cylinder with VVT. That's quite a mouthful. The engine is capable of producing 250 hp and 310 lb-ft of torque. That's quite a difference from the last model which topped out at 187 hp. The engine is well designed. It operates smoothly and provides plenty of power and torque for hauling passengers and cargo. Acceleration feels downright sporty in the CX-5. Engine performance is just one part of the equation when it comes to an overall driving experience. The Mazda CX-5 also gives you fantastic steering and handling. Steering is precise and responsive. This crossover corners like a sports car. There's no noticeable body sway. That's quite a feat for a car in this class. AWD helps the vehicle to hug the road, but the stability is largely due to Mazda's new G-Vectoring Control Plus system. The system is complex, but its primary functions are to control torque, traction and even how your braking power is applied. All lead to an amazing driving experience. The 2019 Mazda CX-5 can seat up to five people. That's one more than your average sedan or coupe. Passenger space is one of the main reasons people select an SUV or crossover. This makes the CX-5 a great vehicle if you have a big family or just like to drive your crew around with you. Cargo space is yet another reason why people love crossovers. They don't just give you a trunk and a back seat. They may not be as big as a full-size SUV, but your average crossover gives plenty of cargo space which can then be extended by configuring the rear seats. The Mazda CX-5 gives you an area of 30.9 cubic-feet while all seats are in use. When the seats are let down, you can extend this to get 59.6 cubic-feet of storage space. The 2019 Mazda CX-5 offers a high-quality, luxurious interior. The quality here is far better than what you would expect from the price point. That makes the CX-5 a great value. The control panels are attractive and well designed. You can opt for fine-leather upholstery. The upper trim packages give you some nice wood and chrome trim throughout the interior. You also get a black headliner and very comfortable seats inside of the CX-5. Ambient lighting adds even further to the overall sense of quality and luxury. The Mazda CX-5 is just as attractive on the outside as it is on the inside. It features smooth, attractive lines that scream quality and style. It truly has the looks one would expect from a more expensive luxury vehicle. It has an elegant, sleek appearance. The engineers have clearly worked to make the car aerodynamic while maintaining the classic, crossover shape. The duel exhaust tips and rear spoiler give it a bit of sporty character. You can opt for all-wheel drive for the 2019 Mazda CX-5. This makes the CX-5 a safer vehicle to drive in rough weather conditions. It also aids in handling as the car really hugs the road during sharp turns. Better traction means you can even take the CX-5 off of the pavement for some light, off-road fun. We've already touched on how stable the CX-5 is during driving. This is further aided by a great suspension system. It provides for a comfortable, bump-free ride. The Mazda CX-5 lacks the stiffness you often find in a compact crossover. It's also really quiet inside of the cabin. There's very little road noise thanks to some great soundproofing. The smooth engine and lack of vibrations in the frame goes a long way here too. If you want a safe vehicle, the 2019 Mazda CX-5 offers plenty of features to protect you and your passengers. The rear camera helps you to avoid collisions while in reverse. There is a wealth of driver-assist systems you can choose. Lane-departure warnings keep you aimed straight ahead. Automatic, low-speed, emergency braking comes standard. Mazda even offers adaptive cruise control. The Mazda CX-5 also has received excellent crash test and safety ratings. The National Highway Transportation Administration gives it 5 out of 5 stars in all but one category, where it still received 4 stars. The Insurance Institute for Highway Safety named the CX-5 a Top Safety Pick. The Mazda CX-5 is already an economical purchase with features and quality normally found only on more expensive vehicles. It can also save you a lot of money at the gas pump. It has one of the best fuel-economy ratings in its class. Most trim levels give you a combined, fuel-economy rating of 31 mpg from the EPA. Only the top levels dip down to 27 mpg, which is still better than most compact crossovers. The rear seats for the 2019 Mazda CX-5 lack the head and legroom you might find on competing vehicles. It's not the worst in its class, but it's not the best either. You can fit average-sized adults back there. They may even be okay for short rides. If you have taller, larger passengers, it can be way too cramped. The rear seats are best for children and smaller adults. The new turbocharged engine is a performance beast. There is also an optional diesel engine with excellent performance and fuel economy. Unfortunately, the base engine lacks the pep and acceleration some competitors offer at this level. If performance is important to you, then the base trim level isn't a viable option. You need to choose one of the better engines to truly enjoy the CX-5. You can only have an automatic transmission system for the 2019 Mazda CX-5. You may be wondering why this matters on a crossover SUV. For many consumers, it simply won't. Crossover fans are often busy people who can't be bothered to manually shift their gears. The thing is, the turbo engine is such a sporty performer, many drivers may wish there was a manual shift. You can opt to override the automatic and manually move up and down the gears. It's just not the same as a classic manual with a clutch though. The 2019 Mazda CX-5 faces stiff competition from the likes of Honda's CR-V, the Ford Escape and the Kia Sportage. Honda's CR-V is one of the top-selling crossovers in the United States. The CX-5 is Mazda's top-selling model. When it comes to price and overall value, Mazda takes the win here. Honda beats the Mazda's acceleration by a small bit, but the overall driving experience is better in the Mazda. The Ford Escape and Mazda CX-5 are similarly priced. The base model for the CX-5 offers more standard features. The base engine in the Ford has slightly better performance. The new turbocharged engine in the Mazda beats the best of what Ford has to offer. Steering and handling is better in the Mazda too. The Kia Sportage has long been considered one of the best values on the road. It's a solid little crossover that comes in at an affordable price. It provides a bit more storage space too. The Sportage lacks the interior luxury and refinement of the Mazda CX-5 though. The CX-5 also outperforms it and once again wins when it comes to the overall driving experience. 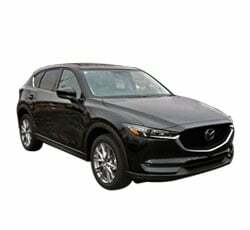 If you're looking for a compact crossover, the 2019 Mazda CX-5 would be a fantastic choice. This is a crowded field in the industry. Realistically, you could always find a vehicle that does one specific thing or another better than the CX-5. The CX-5, however, really does everything very well. It's just not lacking in any category at all. It handles everything you would need a crossover to do, and it does it with style and great looks. It's also much more fun to drive than your average crossover, and it comes in at a great price point too.